I am always excited to see a new book by Caroline Stevermer, and I immediately put this one on hold at my library when I heard about it. I was doubly delighted to discover that, while it is written for a younger audience than the Sorcery & Cecelia books, it is set in the same world. The main character is a new one, an orphan named Frederick who - through the simple fact that he fits a suit of clothes - is chosen to go into service at the house of Lord Scofield, a prominent wizard. The setting is an historic one, England in the early 1900s, but there is magic added to the mix, which makes it extra fun. Frederick is the kind of kid who likes to know how to do things, and he is eager to learn from everyone around him. At the orphanage, he pays close attention in the kitchen, learning about cooking, sharpening knives, and even tying knots. 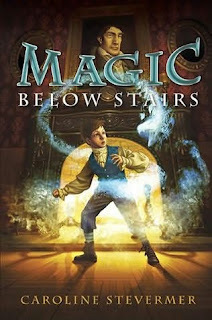 He has an encounter with a strange little man who lives at the orphanage, a mischievous brownie named Billy Bly, and when Frederick leaves the orphanage the creature follows him, creating a sticky situation for Frederick when the wizard discovers his presence. I just loved this book, with the historical background and details, and the glimpses of Lord and Lady Schofield along the way. It's funny and sweet, a magical coming-of-age story with a little mystery thrown in, and I do hope we'll be seeing more of Frederick in the future. Did I tell you I got Sorcery and Cecilia recently? It's very much your and Kiirstin's and Jenny's doing. I can't wait to read it! Hmmm... this book looks more middle grade because of the cover whereas I found Sorcery & Cecilia more YA... is that the case? Nymeth - Now I'm worried that we've built it up too much and you'll be disappointed. But I do think you'll enjoy it. I'll be impatiently waiting to hear what you think! Cat - Yes, this is definitely middle grade, and readers certainly don't need to have read the other books to enjoy this one. It's just a fun plus for those who are familiar with the series. Jenny - I have enjoyed the other Stevermer books I've read, but my favorites are definitely the ones she wrote with Wrede. This is very much in the spirit of those, and I think you'll enjoy it. Fyrefly - If you enjoyed the Sorcery & Cecelia books, this is a must read. It is fun to see the characters from another point of view, and it fills in a little gap between the books. I hope you get the chance to read it.